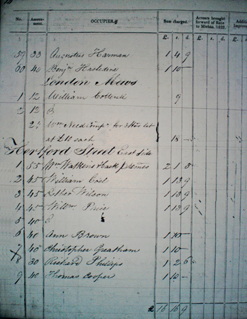 George and Margaret Aitchison were living in London since their marriage in 1817, and moved into 5 Hertford Street in 1824.The two Rate Book exstracts above both date from 1824. The left entry from January has 'E' written against number 5 which signifies that the property is empty. 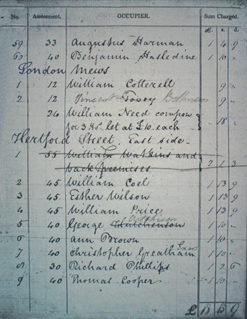 The right hand entry is from July and shows number 5 now occupied by George Hutchinson, which has been altered to correctly show Aitchison. ..............................................Click on these pictures for a larger image. 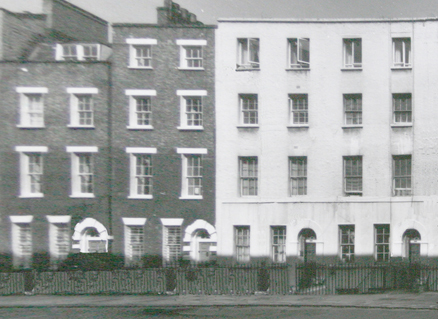 The centre picture shows this part Hertford Street, which is now named Whitfield Street. Shown are numbers 5, 6, 7 and 8 running from right to left.